DEM has developed a cooperation process – Integrated Energy Design (IED) which ensures the relation between form, function, architecture and sustainability. A condition for the IED process to be successful is i.a. that we are included in the design team from the start and contribute with a close dialogue and creative sparring to find the best overall solutions for the building in question. The basic idea of IED is to make use of all the passive qualities of the building deriving from the architectural choices in order to create the best possible indoor climate using only the building itself. Hereafter the building is completed by adding installations at a minimum extent so that the building only is supplied with the necessary lighting, air conditioning, heating and cooling. As it cannot be produced by the building itself. 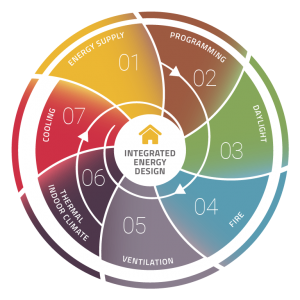 By using the methods from Integrated Energy Design it is possible for the developer, architect, entrepreneur and engineer to cooperate on the building design, so that decisions regarding architecture, technical installations, interior design etc. are made in a systematic process. The final result is a better indoor climate, fewer visible installations, a lower energy consumption, sensible running costs and better cooperation in the design team.